Once the Save Current View As A New View is selected the Copy View window appears as shown in the image below. In this window, we just type in the name of the view we want in the area below Name Of New View. All we have to do is to activate the check box next to where we want to apply the view. In the image below we can see all the Views that I have created. In order to apply one of the Views, we just select the tab View and from the area of the ribbon named Current View we just click on the View that we want to be applied. View Settings: The Advanced View Settings dialog box appears where we can do a lot of adjustments. Rename: The Rename View dialog appears in order to rename the View. Delete: We delete the selected View. New: The Create New View dialog box appears in order to create a New View. 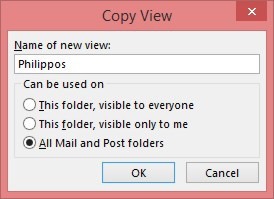 Copy: The Copy View dialog box appears in order to Copy the View. Modify: The Advanced View Settings dialog box appears with more advanced settings to do. Rename: The Rename View dialog box appears in order to rename the selected View. 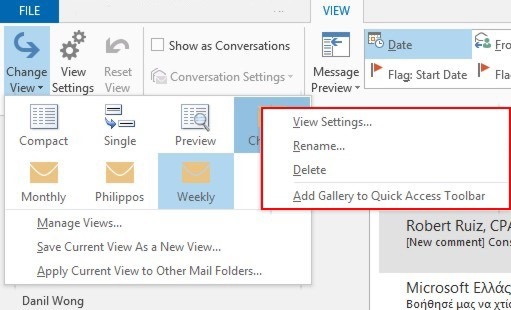 Delete: The Delete View dialog box appears in order to delete the View. So changing the View of our Mail Box is a very easy procedure. We can have as many Views that we want in order to make our life a lot easier. 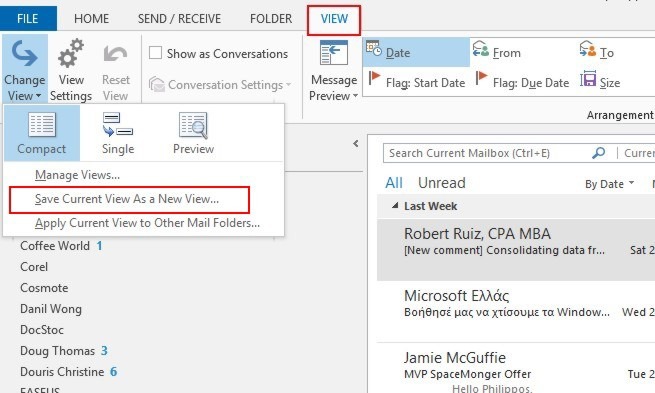 Below you can check out the video describing How to View our Inbox in Outlook 13 the way that we want to. 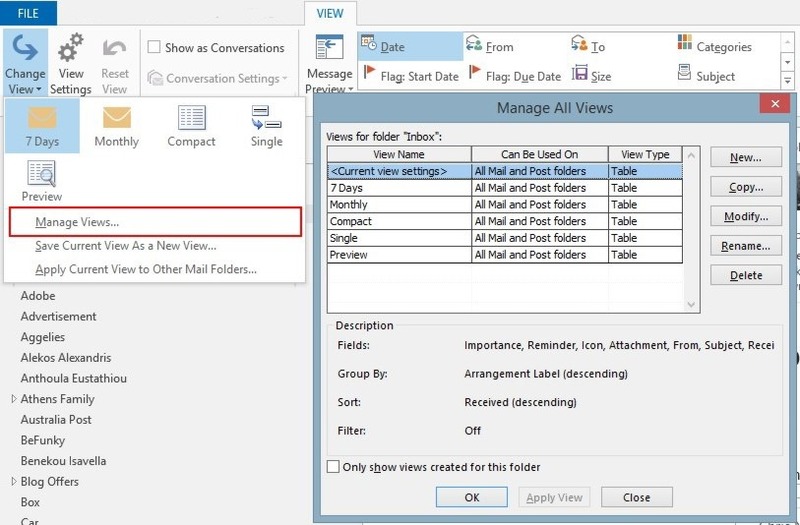 Posted on April 2, 2015, in Microsoft Office 2013 English, Outlook English 2013 and tagged Advanced View Settings, All Mail And Post Folders, Change View, Current View, How to View our Inbox in Outlook 13, Manage Views, Microsoft Office 13, Office Smart, Office System, Outlook 13, Save Current View As A New View, Smart Office, This Folder, View Settings, Visible Only To Me, Visible To Everyone. Bookmark the permalink. 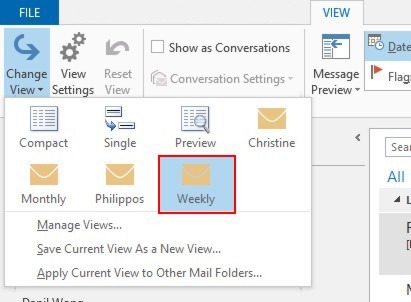 Comments Off on View Your Mail Box The Way You Want in Outlook 13.